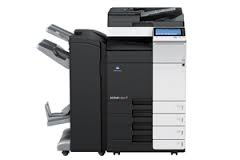 The C227 is a full A3 colour multifunctional with a good level of features. Postscript is standard together with a 45 ipm scanning speed. Colour output is the best on the market and reliability second to none. This really is best value for your money and its in stock for next day delivery. The Bizhub C227 is available in the UK market as the Develop Ineo+ 227 and the Olivetti MF223.